Severe metabolic alkalosis in patients with congestive heart failure is challenging to manage. Diuretics that enhance renal bicarbonate losses, such as acetazolamide, are effective and in some severe cases, hydrochloric acid (HCL) and use of low bicarbonate dialysis may be necessary. 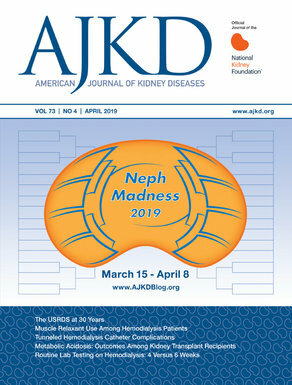 A recent article published in the May issue of the American Journal of Kidney Diseases discusses these strategies in detail. Corresponding author Dr. Aldo Peixoto (AP), from Yale University School of Medicine and VA Connecticut Healthcare System, discusses this topic with Dr. Kenar Jhaveri (eAJKD), eAJKD Blog Editor. eAJKD: What data exists in using hemodialysis or continuous extracorporeal therapy for treatment of severe metabolic alkalosis? AP: I could not find reports in the literature for the use of dialysis or CRRT for metabolic alkalosis. A survey I sent to the Yale-affiliated nephrologists (n=25 respondents) on this question revealed that only 4 of them had used dialysis to treat patients for severe metabolic alkalosis, and all had other indications for dialysis. One of our colleagues, Dr Mark Perazella, had presented a case (in abstract form at a local American College of Physicians meeting) in 1997 of an end-stage renal disease patient with gastric outlet obstruction with severe metabolic alkalosis. Despite hemodialysis with a dialysate of 25 mEq/L, severe alkalemia persisted. It only resolved with bicarbonate-free CRRT. A similar case was noted in a recent publication by Huber et al in AJKD. eAJKD: At our institution, I polled the academic nephrologists as you did and found that 20% had used either HD or CRRT to treat severe metabolic alkalosis. What would be an ideal prescription for severe metabolic alkalosis treatment with hemodialysis? AP: The best approach would use a non-continuous modality: most machines will allow you to bring the bicarbonate down to the 20 to 25 mEq/L range. That should allow a drop in bicarbonate and correct the alkalemia. Unfortunately, there’s no prescription or prediction rule that I know to guide physicians as the experience is limited to anecdotes. In the remarkable anecdote reported by Huber (pH = 7.69 with serum bcarbonate of 112 mEq/L), HD treatment with a dialysate bicarbonate concentration of 30 mEq/L dropped the pH to 7.25 after 3 hours of HD. eAJKD: What forms of acid treatment are available for severe metabolic alkalosis? AP: There are two available options, HCL and NH4CL. When I polled our faculty, 5 had used NH4Cl and 7 had used HCL in their clinical experience, with all but one having used these agents many years ago. If one decides to use HCl, in the text of the article, we provide a relatively specific set of recommendations on how to reconstitute it. eAJKD: Our center’s poll revealed only 20% of faculty members had used HCL in their experience. When I inquired with our hospital pharmacies, they didn’t have it in stock. What practical concerns do you have in getting HCL or NH4Cl in a timely manner from pharmacy? AP: None of the 3 affiliated hospitals for the Yale residency program has HCL in stock. The pharmacies all had hydrochloric acid reconstitution and dispensation procedures. If it was needed, the pharmacist would know how to reconstitute it and provide it for clinical use. HCL is ordered from a distributor using a drop shipment, which can occur on the same day if the order is placed in the morning, or overnight if the order is placed in the afternoon. This is a very practical limitation of this treatment option. The same is the case for ammonium chloride. Dialysis on the other hand, can be arranged immediately in most centers. eAJKD: What are your thoughts on use of NH4Cl and Arginine HCL? AP: NH4Cl is an alternative which may be given into a peripheral vein. During my training, I used it in patients who had COPD and metabolic alkalosis with a good response. There are reports of hyperkalemia complication the administration. NH4Cl is contraindicated by the presence of renal or hepatic insufficiency. In patients with AKI, hyperkalemic risk would be worsened and, in hepatic failure, acute ammonia intoxication can result in coma. Lysine or arginine HCl should be avoided because they have been associated with dangerous hyperkalemia. In the current era of enhanced medicine safety concerns, my sense is that these modalities have limited use. eAJKD: Does mortality change when we treat metabolic alkalosis in heart failure? AP: The incidence of isolated metabolic alkalosis or metabolic alkalosis combined with respiratory alkalosis is probably about 30%, and the majority of patients do not have severe alkalemia. The average pH is in the upper 7.4’s. There are few pHs in the range that really increases mortality. In unadjusted analyses, mortality rises most significantly when the pH exceeded 7.6. I am not aware of any studies that evaluate the impact of treatment of alkalosis on outcomes, be it in CHF or any other patient population. In the most recent trial on ultrafiltration versus diuretic treatment (CARESS), the ultrafiltration group had less metabolic alkalosis compared to the diuretic group but mortality was not different. Nevertheless, there was no significant discussion on metabolic alkalosis in that manuscript. So in summary, we have no answer to that question.